Inspired by an ancient army fighting for a noble cause, 2017 Cantina Di Solopaca Aglianico I.G.P. is a velvety Italian red wine that is made for celebrating victories both large and small. Ruby red and dry, this wine dances across the palate with notes of raspberry and strawberry that are mild on their own but also great with meats and cheeses. This Chianti, a lovely example of the quintessential Italian red, warms the soul with a plush feel, intense notes of red berries, and a hint of smoke. 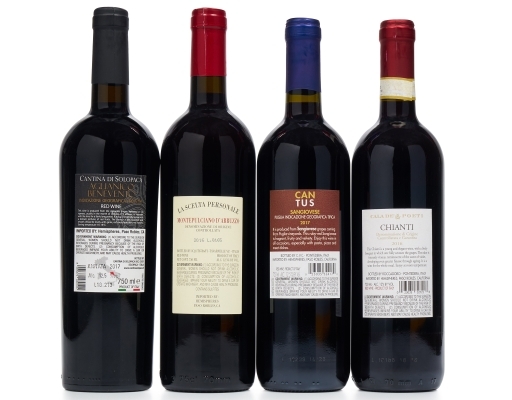 Pair it with a hearty meal and be sure to take a moment to enjoy the label, which features a reproduction of an oil painting created at an artist residency on the Ceppaiano Estate, which the Castellani winemaking family has dedicated to art and culture. If Italy’s a boot, Puglia is located on its heel—an undeserving location for the home of bright sun, refreshing ocean breezes, and wine grapes like the ones in dry, earthy, and satisfying 2017 Cantus Sangiovese di Puglia I.G.T. Open a bottle and bring any meal to life with bold berry and cherry flavors, and a hint of rich figs. 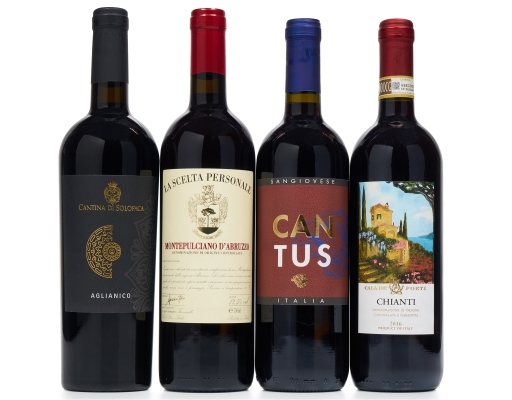 This classic Italian red is a rich, dark purple color with a violet hue. 2016 La Scelta Personale Montepulciano d'Abruzzo offers floral aromas with hints of savory tobacco, leading into a dry and tannic palate that pairs perfectly with meaty Italian dishes.